First Experiences is an exciting new series portraying young children's very first experience of nursery school, time with grandparents and other events. The first time for anything can be daunting, and these books set out to familiarise children, through simple read-aloud words and beautiful photos, with what seems, at first, unfamiliar but will eventually become a routine part of everyday life. 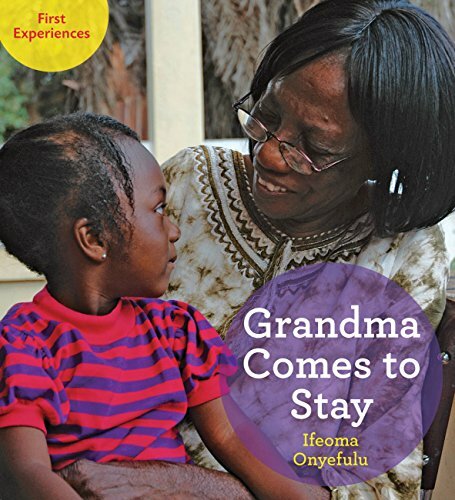 In this book set in Ghana, Stephanie is getting everything ready because Grandma is coming to stay. Grandma shows Stephanie how to wear traditional dress, reads her favourite book, and takes her to see real-life dancers at a festival. In return, Stephanie shows Grandma how to kick a ball, ride a bike and play the drum. Ifeoma Onyefulu was broughout up in a traditional village in Eastern Nigeria. Her highly acclaimed children's books are renowned for countering negative images of Africa by celebrating both its traditional village life and its urban life. A is for Africa, her first book, has become a classic title in the genre of cultural diversity and was praised by Publishers Weekly for its 'incisive view of her country's rich heritage'. Ifeoma has twice won the Children's Africana Book Award: Best Book for Young Children in the USA> Here Comes our Bride won the award in 2005 and Ikenna Goes to Nigeria in 2008. Ifeoma lives in London with her two sons. Find out more about Ifeoma's books at www.ifeomaonyefulu.com.